Wow it’s 2011 already. I hope everyone out there had a great Holiday season. I’m looking forward to what 2011 brings. My life was a bit hectic in 2010 so hopefully 2011 brings some peace and quiet. I love watching shows and luckily there’s always a fun production to see in San Francisco. One of the fun perks of my job is free tickets to some of the shows. Two days before Christmas, I saw Forever Tango which was playing at the Marines Memorial Theater. The theater is actually located in the 2nd floor of the Marines’ Memorial Club and Hotel, which is a good hotel right off of Union Square for those who were in the service. All of the advertising for Forever Tango prominently featured Cheryl Burke from Dancing with the Stars. I’ve never watched an entire season of the show, just a few episodes here and there. The doorman at the old office location was an old man who would eagerly talk to you about everyone and everything. The morning after an episode of DWTS, he would ask me the same question, “Did you watch DTWS last night?” Every week, my answer remained “No,” at which point he would tell me who was absolutely horrible and needs to be kicked off. Sometimes I got lucky and he would be sleeping when I walked in. Now that we’ve moved to a new building with doormen who don’t even acknowledge you, I have to say I miss the old guy. Cheryl Burke is one of the most famous dancers to come off of the show so I guess they figured they would boost ticket sales with her. While she danced very well, she wasn’t actually in the show that much. The show was still great fun though. I loved the dances, the live band which featured some of the most energetic accordion players I’ve ever seen (okay…I haven’t seen many accordion players live), and the Argentine singer. There was a red headed dancer whose flexibility I really envy. Some of the moves she did had me wondering if she ever gets whiplash. 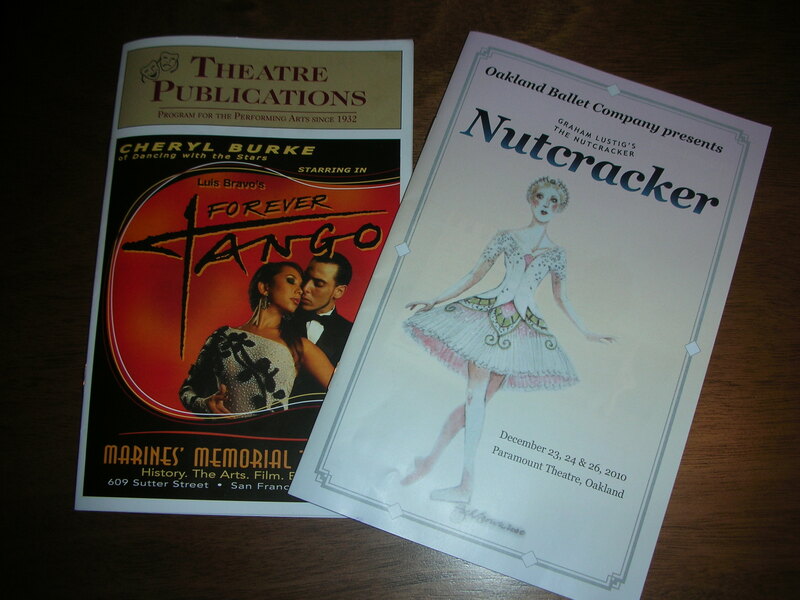 The next day the same friend and I saw the Oakland Ballet’s The Nutcracker, set to music by the Oakland East Bay Symphony. Oakland, just across the bay from San Francisco, is in the news quite a bit but for all the wrong reasons. The city is known for its high rate of poverty and crime and is routinely ranked as one of the most dangerous cities in the U.S. This isn’t true for all parts of the city. The Oakland hills, Piedmont and Montclair areas are home to some of the most expensive homes in the region. College and Piedmont Ave. are walkable neighborhoods with blocks of charming shops, restaurants and cafes. Downtown Oakland, like so many city downtowns across the country, is still trying to shed its grittiness. While there’s some improvement, it’s still pretty much a dead zone on the weekends without the worker bees around. One of the shining spots in the area though is the Paramount Theater, one of the most beautiful art deco theaters in the country. Walking into the building, a National Historic Landmark, you can’t help but be impressed by the grand lobby, gold ornamentation and Egyptian motifs. Everywhere you turn, you’re struck by beauty, even in the woman’s restroom. Watching The Nutcracker for the first time in such a historical monument was a wonderful way to start Christmas Eve. Christmas day was spent at my sister’s house. Eating lunch, opening presents, watching movies, and then eating leftovers for dinner. Hubby was unprepared for how my family opens presents, which is basically everyone grabbing their gifts and ripping off the wrappings in a frenzy. In less than 10 minutes, wrapping paper was everywhere and I was left confused at what Hubby and I actually got as gifts LOL. Hubby was reminiscing about Sinterklaas in Holland, where they would all sit in a circle and open their presents one by one while reading poems that accompany the gifts. In Holland, the main event is actually not Christmas with Santa Claus, but Sinterklaas on December 5. On December 5, Sinterklaas arrives by boat to Holland from Spain. With him are his helpers, Black Petes, who are now played by native Dutch people in black faces. This image of a white person in black face is always a little startling for those of us not from Holland. There’s no way that something like that could ever happen in the U.S., where blackface was used to propagate American racist stereotypes…but of course we can’t export U.S. racial relations to the Netherlands. The origins of Black Pete is debatable. Nowadays, the politically correct tale is that his face is dark from going down the chimney to give children their presents. Every time Hubby explains it this way, I have to ask, “So going down a chimney also makes their hair curly and black?? ?” I think it’s pretty safe to say that the Black Petes are Sinterklaas’ slaves from Africa. If not slaves, then they’re just kind natives who want to help this old man give presents to children in a far away land 🙂 Every year in Holland, there are discussions in Holland about the political correctness of Black Petes. They tried having Rainbow Pete one year but it wasn’t very successful. As Christmas keeps gaining in popularity in Holland, some give presents on both Sinterklaas and Christmas. I think while Hubby missed the old traditions, he very much liked the U.S. custom of giving nice and expensive presents. New Year’s Eve we went out to dinner and a lounge with some friends. 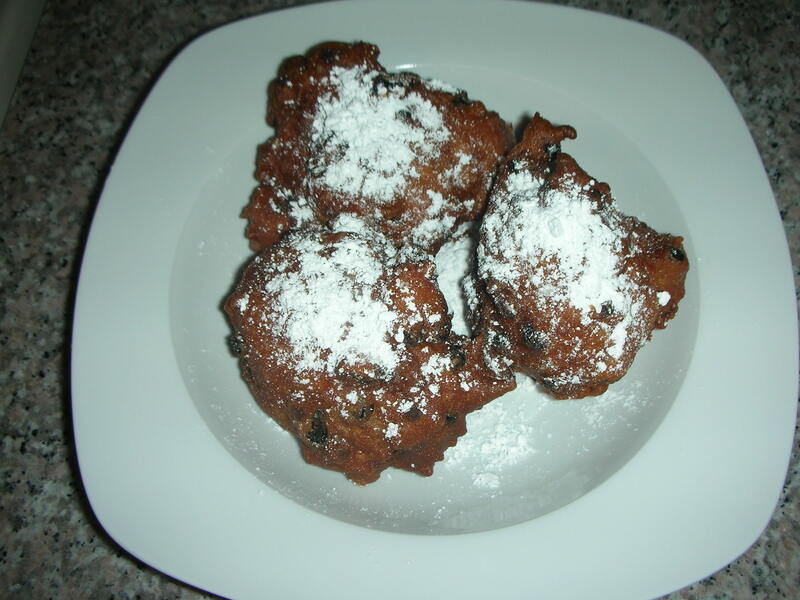 We got a deep fryer which made it very handy to make oliebollen, Dutch donuts that are eaten around New Years. We put them in paper bags and passed them. I estimate that I’ve eaten about six of them so far! Well that’s it for 2010 folks. May 2011 bring happy travels!